it is on a set of fields that form a candidate key. it is on a set of fields that include the primary key. the data records of the file are organized in the same order as the data entries of the index. the data records of the file are organized not in the same order as the data entries of the index. A database index is clustered if physical records on disk follow the index order. 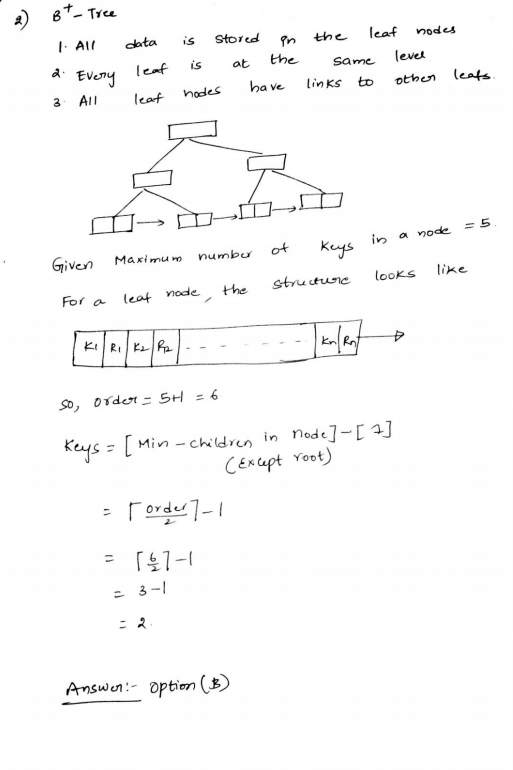 This solution is contributed by Anil Saikrishna Devarasetty Another one: Since the maximum number of keys is 5, maximum number of children a node can have is 6. By definition of B Tree, minimum children that a node can have would be 6/2 = 3. Therefore, minimum number of keys that a node can have becomes 2 (3-1). A clustering index as the name suggests is created when the data can be grouped in the form of clusters. For example: A small database file storing roll no and subjects enrolled for a particular student. Here data can be grouped on the basis of Roll No.s. Hence to create such kind of index files, fields could be non-key attributes and which are in ordered form so as to form clusters easily. Hence option (A) – non key and ordering. Additional points for Clustered Indexing: 1. 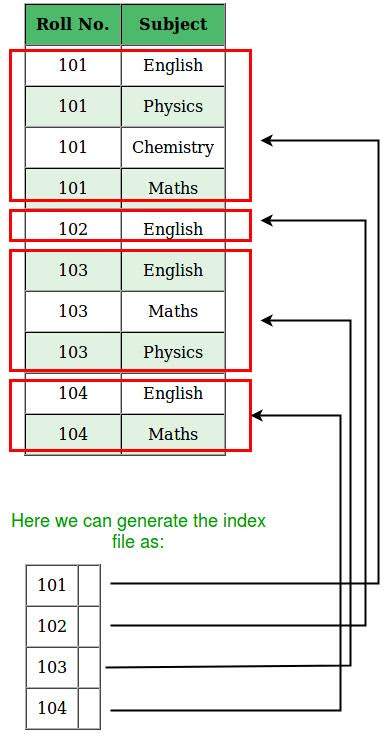 The number of entries in the index file are the unique values of the attribute on which indexing is done. 2. The pointer in the index file will give the base address of the block in which the value appear for the first time. http://quiz.geeksforgeeks.org/indexing-in-databases-set-1/ This solution is contributed by Yashika Arora. A FAT (file allocation table) based file system is being used and the total overhead of each entry in the FAT is 4 bytes in size. Given a 100 x 106 bytes disk on which the file system is stored and data block size is 103 bytes, the maximum size of a file that can be stored on this disk in units of 106 bytes is ____________. Here block size is 10^3 B.
the size of the blocks, and the size of the ad­dress of the blocks. In the index allocation method, an index block stores the address of all the blocks allocated to a file. When indexes are created, the maximum number of blocks given to a file depends upon the size of the index which tells how many blocks can be there and size of each block(i.e. same as depending upon the number of blocks for storing the indexes and size of each index block). Thus, option (B) is correct. In Clustered Index, data blocks are stored in a way to match the index. Therefore, only one clustered index can be created on a given database table. Refer https://msdn.microsoft.com/en-IN/library/ms190457.aspx for more details. Number of block access = nr * bs + br where br and bs are number of blocks in relations R and S respectively, and nr is the number of tuples in relation R.
We select the relation with small number of tuples as outer relation R. So, R is T2. B-trees are for storing data on disk and B+ trees are for main memory. Range queries are faster on B+ trees. B-trees are for primary indexes and B+ trees are for secondary indexes. The height of a B+ tree is independent of the number of records. There are 5 records in a database. There is an index file associated with this and it contain the values 1, 3, 2, 5 and 4. Which one of the fields is the index built form? The index field associated with the values 1, 3, 2, 5 and 4 is the Occupation field because after sorting the Occupational field lexicographically will give the sequence 1, 3, 2, 5, 4. So, option (C) is correct.